GENERAL PRODUKSI SCAFFOLDING, LADDERFRAME, MAINFRAME & CROSSBASE, WING NUTS, TIE RODS, JOINTPIN. 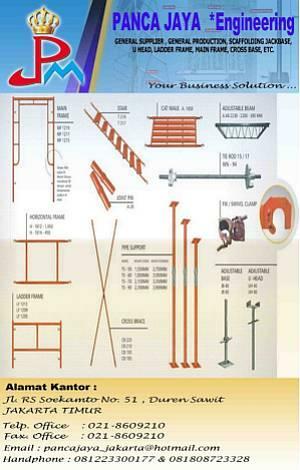 LadderFrame, Crossbase, Mur Support, Pipe Support, Tieyok, Pahat, dll. Alat Konstruksi.